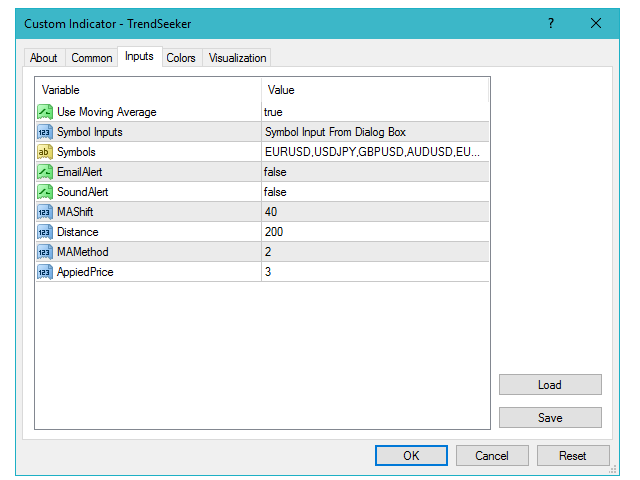 Trend Seeker is the multi-currency and multi-time frame version of 'The Trend is Your Friend' indicator. You don't need to purchase that indicator, it's already built into this one. You can double click on the dashboard to drag it around the chart. Sym - Enter in here the names of symbols you want it to track, you can use prefix and suffix if your symbol have them. Each symbol is separated by a comma. You can enter in as many symbols as you want. 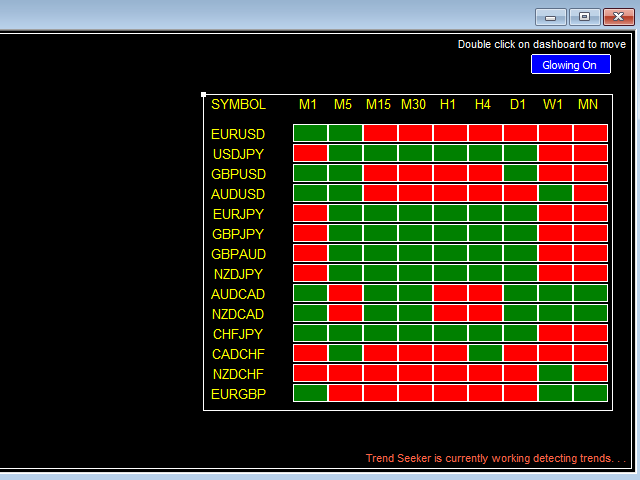 MAShift: 40 - number of days for moving average lines to identify the trend color red or green. I find this default setting to be accurate, you can adjust it to whatever number of days you want. If the 40 days moving average line is showing red in the 1 minute chart, it will display red color in the 1 minute box. If the 40 days moving average line is showing green in the 5 minute chart, it will display green color in the 5 minute box. If the 40 days moving average line is showing red in the 15 minute chart, it will display red color in the 15 minute box. If the 40 days moving average line is showing red in the 30 minute chart, it will display red color in the 30 minute box. If the 40 days moving average line is showing red in the 1 Hour chart, it will display red color in the 1 Hour box. If the 40 days moving average line is showing green in the 4 Hour chart, it will display green color in the 4 Hour minute box. If the 40 days moving average line is showing red in the 1 Day chart, it will display red color in the 1 Day box. If the 40 days moving average line is showing green in the Weekly chart, it will display green color in the Weekly box. If the 40 days moving average line is showing red in the Monthly chart, it will display red color in the Monthly box.